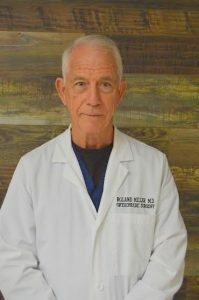 Since 1976, when he graduated from Louisiana State University School of Medicine at New Orleans, Dr. Roland C. Miller has provided excellent orthopaedic care to residents of the Abbeville area. Dr. Miller is affiliated with Abbeville General Hospital in Abbeville. Dr. Miller treats each of his patients on a personal level. He is widely recommended for all types of orthopaedic care. From sports or work-related injuries to workmen’s comp injuries, Dr. Miller provides the highest quality of care. We are pleased to have you as our patient. Our skilled, compassionate staff is happy to assist you through your care and recovery.